Clifford and Emily Elizabeth, as they appeared in the original “Clifford” series that launched in 2000. CPTV is pleased to share that Scholastic Entertainment recently announced the relaunch of the beloved, multiple-Emmy-winning preschool series Clifford The Big Red Dog. Based on the best-selling Scholastic book series by Norman Bridwell featuring the larger-than-life dog and his best friend Emily Elizabeth, the reimagined animated series will come to CPTV Kids and Amazon Prime Video in fall 2019! Although still set on Birdwell Island, Clifford The Big Red Dog will offer fresh and colorful new locations. The rebooted show will also have a strong emphasis on social-emotional skills such as empathy, along with a solid curriculum designed to boost early literacy and encourage imaginative play – teaching as it entertains with Clifford-sized humor. The first Clifford The Big Red Dog animated series premiered on PBS in 2000. The show garnered numerous awards, has aired in 110 countries, and even inspired a spin-off series, Clifford’s Puppy Days. Now, don’t miss Clifford and Emily Elizabeth’s triumphant return to PBS, and to CPTV Kids! Stay tuned for more information on the new series, coming in 2019. DID YOU KNOW? 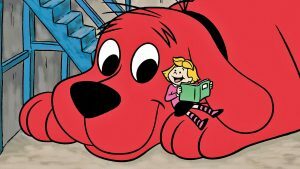 : Scholastic published the first Clifford The Big Red Dog book in1963, and today there are more than 133 million Clifford books in print in 16 different languages!